Start up the seaplane, there’s been a gold heist! The security officer driving the armored truck radioed in an ambush and he needs help. Fly in and fire the net shooter at the crook in the amphibious craft. Watch out for the bees – the other crook made them mad when he chopped down their tree. Every day is an adventure with the LEGO® City Mountain Police officers! Price is 4% below the initial Lego retail price, a € 2.00 discount! This comes down to 11.11 cent per brick. The Mountain River Heist (60175) Lego set is available from the sites below. However, they do not offer delivery to your selected region. 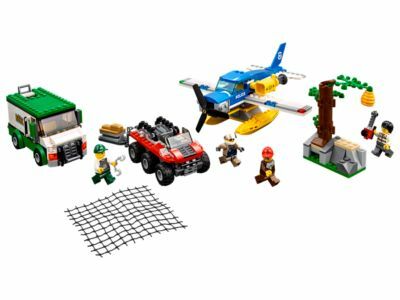 The Mountain River Heist (60175) Lego set is no longer directly available from the sites below. However, 3rd party partners of these sites might still have the set available. Alternate description Keep the crooks from escaping with the gold bars!